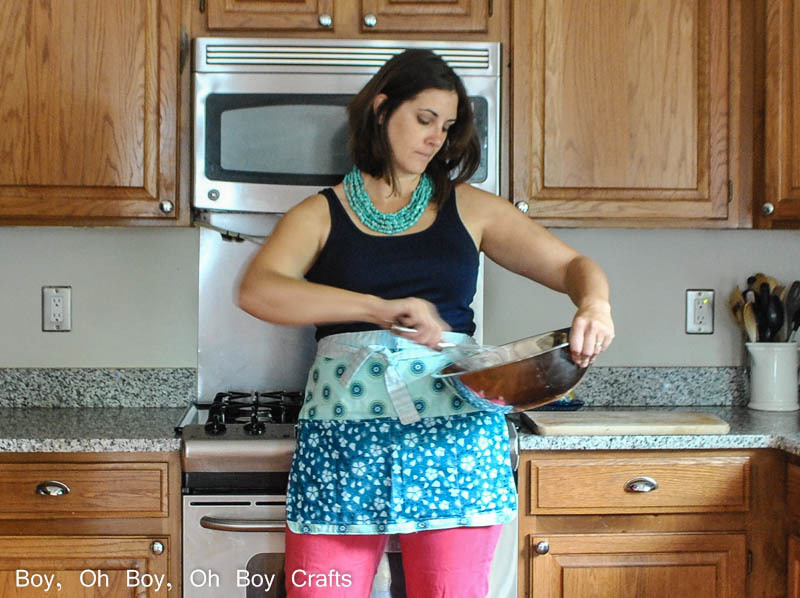 Half aprons are perfect for protecting your clothes for a variety of purposes, whether in the kitchen, out in the garden, or crafting with children. I’ve found that they make much appreciated teacher gifts as well. I can’t tell you the number of times I’ve ruined clothing while teaching. If you want to bring a big smile to a Primary School Teacher’s face, sew one from this free half apron pattern. I’ve made one for each of the boys’ teachers the last few years for Teacher Appreciation Week and have received a super, positive response from each. With this free pattern, you can whip one (or more) up in no time. Here’s what you need. Press 1/2 inch to the wrong side on the top and bottom of the pocket. Topstitch the pocket top. Place the pocket piece, wrong side together with the front fabric piece. Edge stitch along the bottom edge of the pocket to secure in place and make 2 vertical stitch lines to create three smaller pockets from the larger pocket. Then, sandwich the three apron pieces, right sides together, with the right side of the pocket facing the right side of the back apron piece. Sew around the outside edge of the apron using a 1/2 inch seam allowance, and leaving a 5-6 inch space for turning. Clip the corners and notch the round edges. Then turn right side out. Fold the short ends of the waistband to the wrong side, 1/2 an inch and press. Fold the entire strap in half, wrong sides together and press. Open the strap back up and press each half (the long way) to the crease. Then press in half (wrong sides together). You’re now ready to attach your waistband. 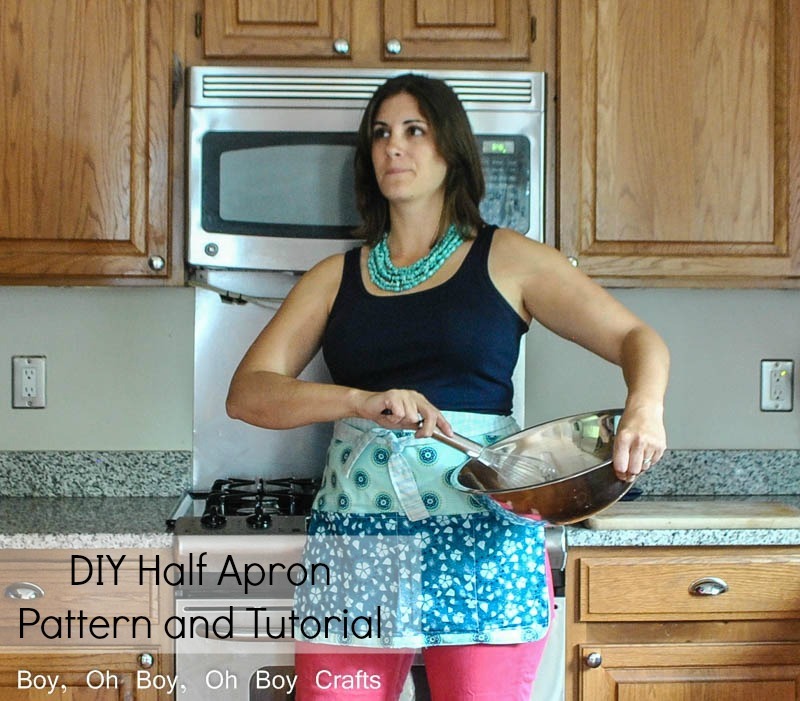 Fold your waistband and apron in half and press or mark the 1/2 way point. Match the line on the waistband and apron, sandwiching the apron between the the open waistband and pin closed. Pin along the entire length of the waistband and sew. When sewing, start at the right hand short side, back stitching after a few stitches and continue along the edge of the waistband until you reach the other end. 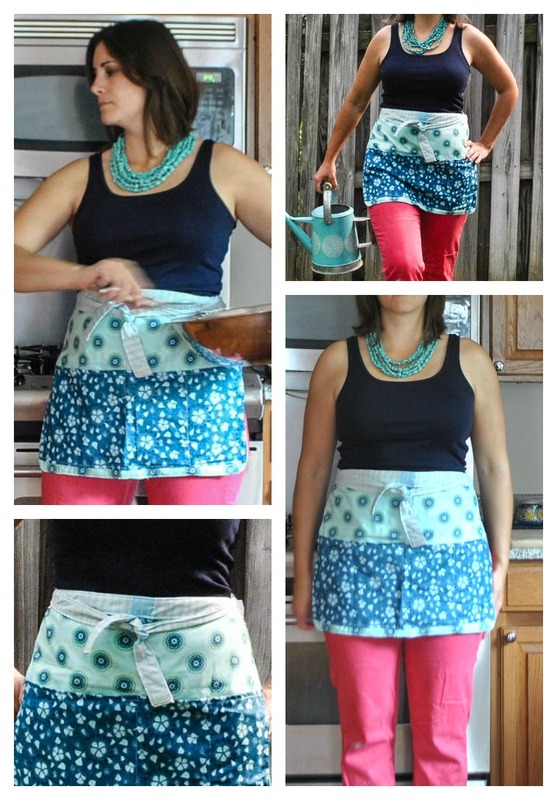 Rolling the apron will help to less the bulk as you sew on the waistband. Mission complete. The perfect preschool or elementary school teacher gift to show your appreciation and keep the marker, chalk, mud and other undesirable kid associated mess off your favorite teacher’s pants/skirt.